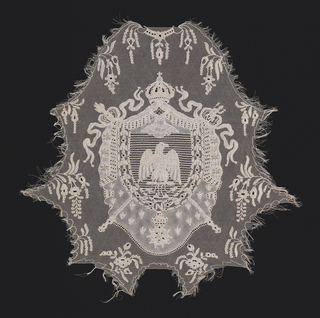 See more objects with the tag allegory, preparatory, flowers, royalty, designers, commemorative, shell, eagles, wreaths, craftsmen, celebration, Napoleon, roses, stars, embroiderers, medal, imperial, embroidery. See more objects with the color tan peru sienna antiquewhite or see all the colors for this object. This is a Drawing. 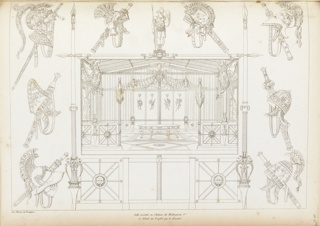 It was attributed to Jean-François Bony and made for Fabrique de Saint Ruf. It is dated ca. 1810 and we acquired it in 1920. Its medium is brush and white gouache on laid paper, coated with resin, joined. It is a part of the Drawings, Prints, and Graphic Design department. The resin coated paper of this design has yellowed with age, providing a crisp contrast with the white gouache. It was once a transparent tracing paper, referred to as papier huilé in France, where it was made. 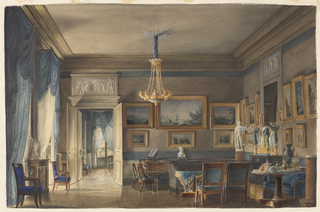 Tracing papers were used by designers and craftspeople who wished to make copies of an existing drawing. Each detail of this embroidery design for a chair back or wall hanging has been carefully delineated, providing a clear working instruction for the embroiderer. The symbolic language of the design is immediately recognizable as being Napoleonic. 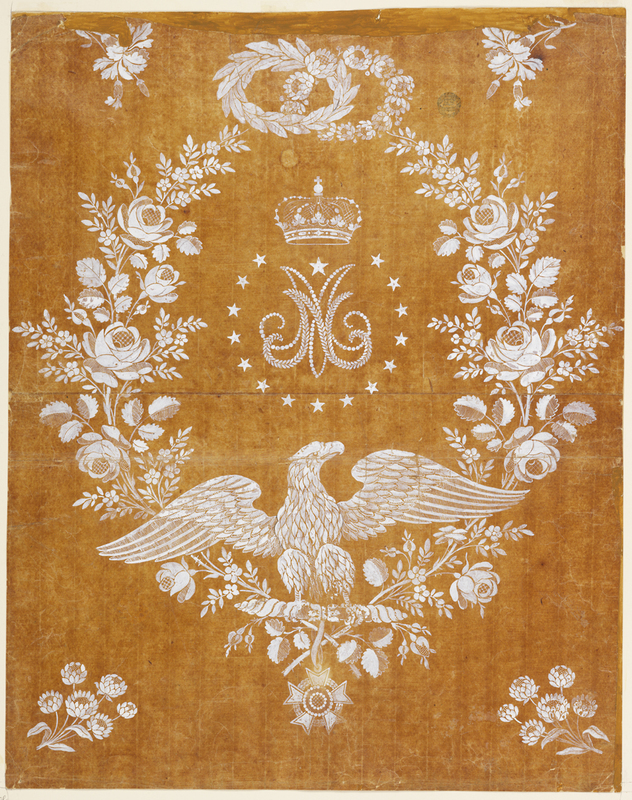 As emperor, Napoleon Bonaparte’s chosen emblems were used endlessly to express imperial power. Entwined beneath a crown, the initials 'N' and 'M' commemorate the marriage in 1810 of Napoleon to his second wife, Marie-Louise of Austria. The couple’s cipher is circled by five-pointed stars of the Bonaparte family coat of arms. Below, an eagle clutching the Legion of Honor medallion evokes the power of imperial ancient Rome and the Carolingian dynasty. The wreath of roses is an allusion to the youth of Marie-Louise, while the laurel wreath is a classical symbol of triumph. 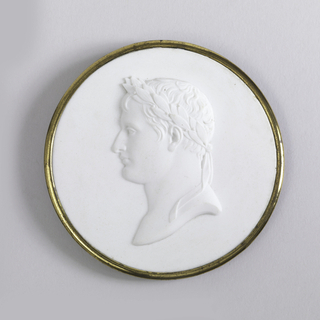 This object was featured in our Object of the Day series in a post titled Napoleon's Other Wife. Stamped in black ink, upper right: Museum for the Arts of Decoration, Cooper Union.